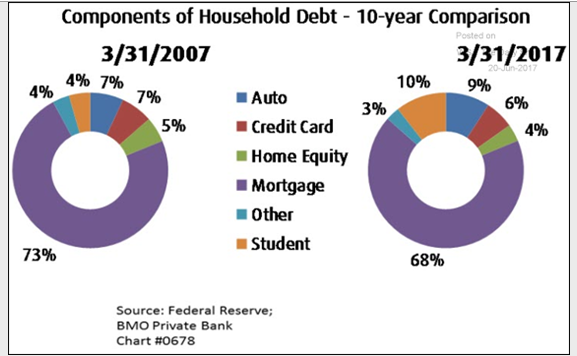 Total student debt, credit card debt and auto loans have each passed the $1 trillion mark in the U.S. Eventually we will have a good old fashioned cyclical recession with a secular bull market—a crash or bubble burst is not likely. Don’t let the headlines or recency bias cloud your thinking. Stick to your long-term plan. American Investors Have a New Obsession with Bubble Spotting. In classic Wall Street storytelling, a Master of the Universe makes a fortune for himself and a small group of investors through an unpredictable cocktail of IQ, testosterone and hubris. This strategy is usually executed through huge bets placed on certain companies, bonds, real estate, etc. that work in exponential fashion, thus catapulting the Master to celebrity status in American culture. Remember “Greed is good”? Remember Michael Lewis’s novel about Wall Street traders that wagered $1 million as a side bet on a game of “liar’s poker” during the work day while tens of millions worth of bonds were traded around them? 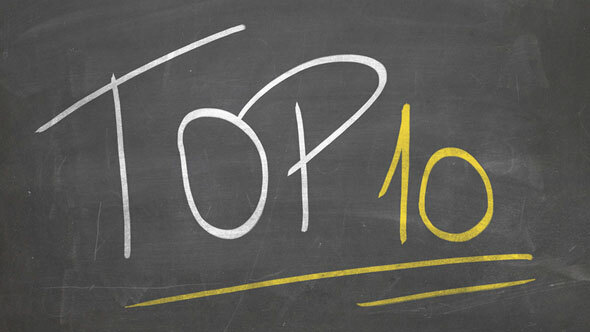 Americans love to hear how down-to-earth stock pickers like Warren Buffett and Peter Lynch choose their winners. Americans also love the Wall St. antiheros like “Predators Ball” junk bond raiders, or Jim Cramer, host of the frenetic CNBC show “Mad Money,” that is part vaudeville part, mad scientist act. During the 2008 financial crisis, the titans of The Street were no longer bold traders, but a group of unknown hedge fund managers that made a fortune betting against the market. Books and movies would follow about how those savvy contrarians who predicted a short circuit to the American Dream—a disaster that took the mightiest country in the world to the brink of complete financial chaos. Most citizens have no idea how close we came to the temporary collapse of the banking system and world capitalism. This terrifying scenario was driven by an enormous mountain of debt attached to a pillar of the American Dream—people’s homes. The crisis also led to a new financial super sport called “bubble spotting.” After the crisis, every young MBA/CFA/hedge fund manager wanted to be the next Michael Berry or Steve Eisman who could find the next “Big Short.” Meanwhile, the second biggest bull market in history emerged from the crisis, and passed half of the nation’s investors by as they remained shell-shocked from the near-meltdown of 2008-2009. I just finished reading Roger Lowenstein’s fabulous biography of Warren Buffet (Buffet – The Making of an American Capitalist) featuring thought-provoking descriptions of Buffet’s personal life that formed his controlled temperament for investing. One part of the book made me muse over today’s market—did you know that that it took Wall Street veterans 25 years to become bullish again after the 1929 crash. That’s right. Twenty-five years! The scars were so deep from the Great Depression that even Buffet’s hero, Benjamin Graham, the scion of value investing, questioned his entire thesis about putting one’s money into low-cost value stocks. Echoes of 1929 have followed the most hated bull market in history as it roars through its eighth consecutive year. Yes, valuations are on the high end of the spectrum and a correction may be due. But a bubble-like crash is another story. Most of “today’s crash” predictions revolve around debt implosions that are due to a simple behavioral finance ailment called “recency bias.” Recency bias is a phenomenon in which people are significantly more affected by recent events in their lives than they are about past events. The 2008 financial crisis left people’s homes, stock portfolios and work lives at half-mast. The debt bubble in housing is still so fresh in the minds of American citizens that they are acutely sensitive to anything that seems like excessive debt. Our firm is working with a consultant to help us tell our story. It may surprise you that the consultant wants us to share negative (not positive) stories about our clients’ lives. The idea is to tug at heart strings and to find a connection through negative events. Human psychology (and the news media) dictates that “if it bleeds it leads.” Just look at the recent July 4th holiday. We live in the greatest country in world, and even on our nation’s Independence Day, the news was full of negative stories. As always, people can’t turn their eyes away from a car crash. Our financial car crash is now bubble spotting: Muni debt, Japan debt, China debt, student loan debt, car loan debt, credit card debt, etc. Today I want to tackle three current bubble spotting myths. A Trillion Here a Trillion There. Pretty Soon We Are Talking Real Money. Student debt, credit card debt and car loan debt have each crossed the $1 trillion mark in the U.S. Not that long ago, one billion dollars was considered a lot of money. But, that’s like comparing Magic Johnson’s $2 million a year NBA salary from the 1980s and 1990s to Steph Curry’s $80 million annual pay today. Let’s tackle each bubble myth one at a time and apply some second level thinking. Big numbers like $1 trillion grab headlines, but the truth lies in the details. Many believe these lazy generation Y kids (born in the 1980s or early 1990s) will never move out of their parents’ basements because they are so sacked with student debt and useless undergrad degrees in philosophy. Personally I think philosophy is a great major, but that is beside the point. We are graduating the highest percentage of college students in U.S. history and we have a majority of women not only graduating from college, but doing so at the top of their class. This isn’t a just good thing; it’s an awe-inspiring movement to a more educated society. It also means we are preparing a work force for an increasingly complex, tech-driven service economy. While this progress could make the class divides in our society even greater, that is a topic for a different paper. 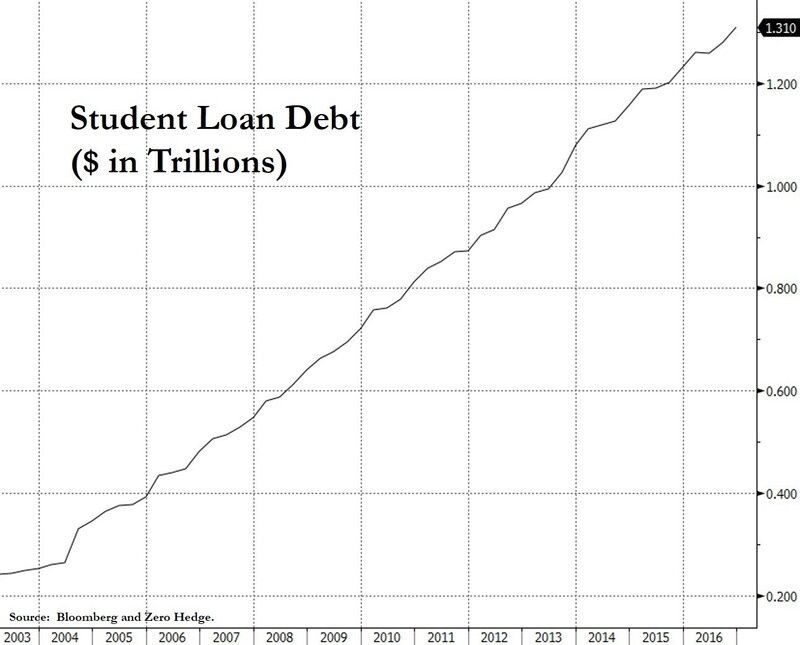 Most articles written about the dangers of student debt start with a scary chart like the one below. You’re supposed to think to yourself: “Oh no. 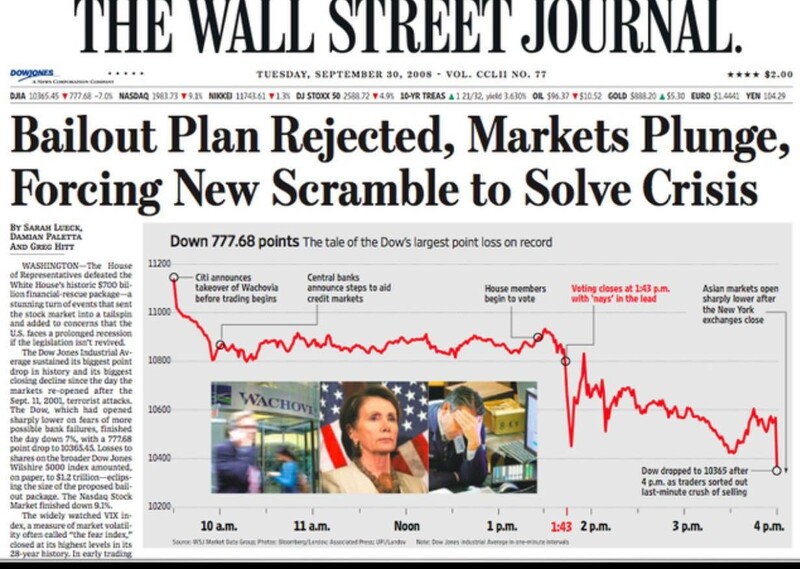 Another crash is coming!” My favorite is when the media overlays the student debt chart with the NASDAQ 1999 chart. Instead, this chart below is a reflection of the largest generation in American history coming into its prime college years. It also shows the democratization of education in America. But, the media will paint the picture more negatively, inevitably describing a tale of woe about a 20-smething waiter who has no career path and $200,000 in student debt. But, how many of these extreme examples exist? Again, the devil is in the details. 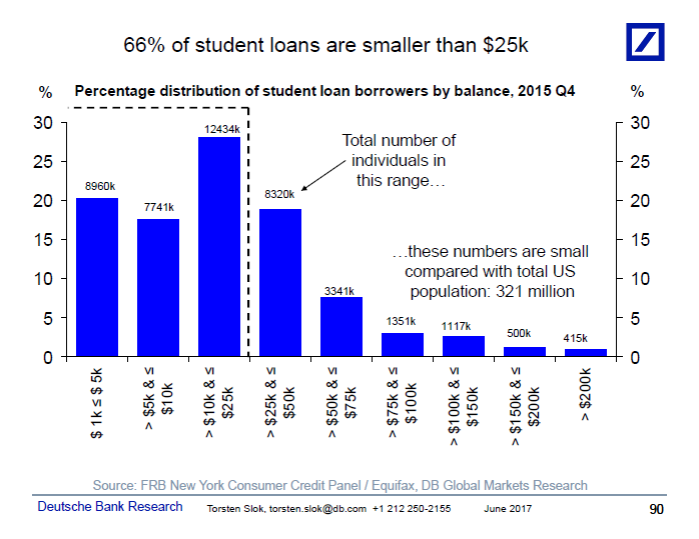 Underneath the daunting $1 trillion chart is a much more manageable number–two thirds of student loans (66%) are smaller than $25,000. What’s more, the average monthly payment on a $25,000 student loan is a manageable $280. 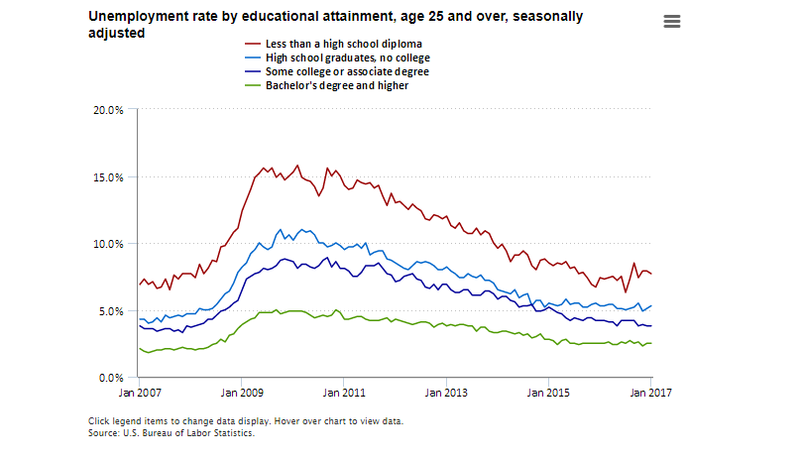 And, the current unemployment rate for college graduates is a stunning 2.5 percent. Even more salient is the fact that 85 percent of student borrowers owe less than $50,000 on their loans. Unemployment for college grads 25 and over 2.5 percent and the first wave of Boomers turns 70 this year, so Millennials will be replacing their parents in the workforce for the foreseeable future. Is student loan debt an issue? Yes. It will delay homeownership and household formation for many young graduates. But, calling student debt a bubble that’s big enough to threaten the U.S. economy is a stretch. Comparing student debt to the 2008 housing bubble or the 1999 dot-com bubble is an absurdity. Credit card debt also hit the $1 trillion threshold this year, but consumer debt service is at all-time lows while sub-prime mortgage debt has disappeared from the landscape. Americans’ finances are actually in the best shape they have been in years. As a group, the debt-to-income and debt-to-asset ratios of American households in the first quarter fell to their lowest levels since the early 2000s. A prolonged period of low interest rates has made that debt easier to bear. The Federal Reserve reported recently that households’ overall debt-service ratio—the share of after-tax income going toward debt payments—is near historic lows. Yes, we have more credit card debt than ever. Just remember that 70 percent of GDP is consumer spending and the economy is still humming along with personal balance sheets that are not yet stretched. At some point, we will have a recession, but until then, credit is helping to drive consumption. It’s true that charge-offs from credit card companies have ticked up. But, calling today’s credit card situation a threat to the economy is tough to fathom as charts like the one below demonstrate. 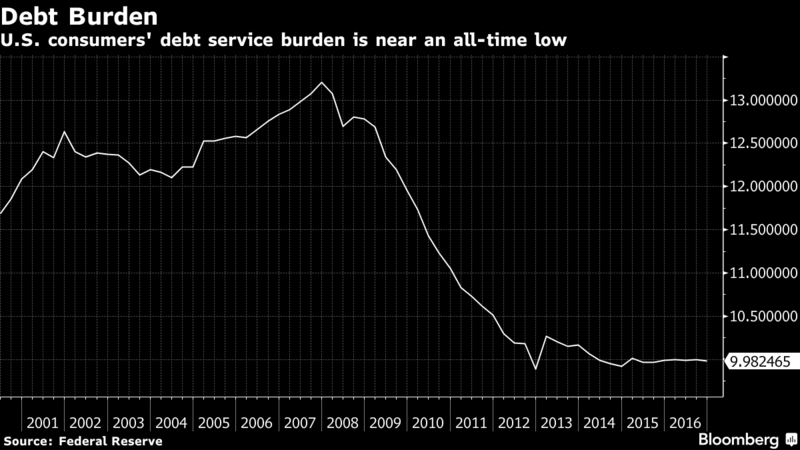 Low interest rates and the re-set from mortgage crisis leaves consumers debt service at historical lows. Americans have had a love affair with their cars ever since President Eisenhower signed the Federal Highway Act in 1956. That’s what many say opened the suburbs to the urban masses and sparked commuting across the U.S. via family sedans. Car sales have ebbed and flowed with the economy ever since they became a big part of our free market system. Today’s consumers aren’t much different from those in the 1950s. 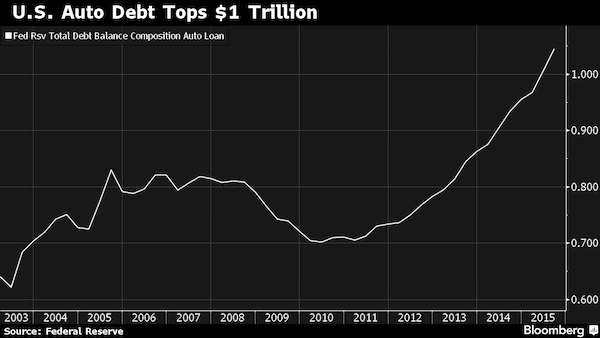 But, here we are at $1 trillion mark in auto debt and a recent uptick in sub-prime auto delinquencies has sparked a spate of bubble headlines. Those stories usually include misleading bubble charts like the one below. There is a major problem with the sub-prime auto bubble thesis, however. Although borrowers with lower credit ratings make up 20 percent of the auto market today, they are a pimple on the rear end of the U.S. economic elephant. In 2014, roughly 14 percent of mortgage debt was delinquent or in foreclosure. In other words, around $1.5 trillion of debt was considered “troubled.” By comparison, lenders reported that about $23.7 billion in auto loan debt was delinquent at the end of 2016. That’s 1.4 percent of the sub-prime mortgage debt crisis and less than the total NBA salary cap. Warren Buffet alone is sitting on $100 billion in cash, so he could take down an implosion of sub-prime car debt all by himself in just one hour. The growth of subprime auto loans is significant, but not a threat to larger economy. As Howard Marks, my favorite Wall Street second level thinker says, “Most things will prove to be cyclical.” American pundits have a new obsession with bubble spotting that’s reminiscent of the post 1929 crash. Although we are closer to the end of the economic and bull market cycle than the beginning, be wary of the soothsayers selling crash theories. Exponentially more people lose money by missing the 100 percent gain that typically follows a correction than who avoid the 20 percent loss that accompanies a correction. Over the past 70 years the S&P 500 index has experienced 12 corrections of 20 percent or more and the index is still up 15,000 percent over that period. Yes you read that correctly—UP 15,000 PERCENT! The market has had corrections of at least 5 percent in 88 out of the past 89 years and has had 10-percent corrections in 67 out of the past 89 years. So, statistical probabilities favor a pullback in the near future. But, instead of worrying about tiny bubbles, just understand that our next crisis will be a good old-fashioned cyclical recession in a secular bull market. At Fortis, we are closely watching the yield curve for signs of a recession, as well as accelerating inflation, rising initial jobless claims and rising inventory-to-sales ratios. 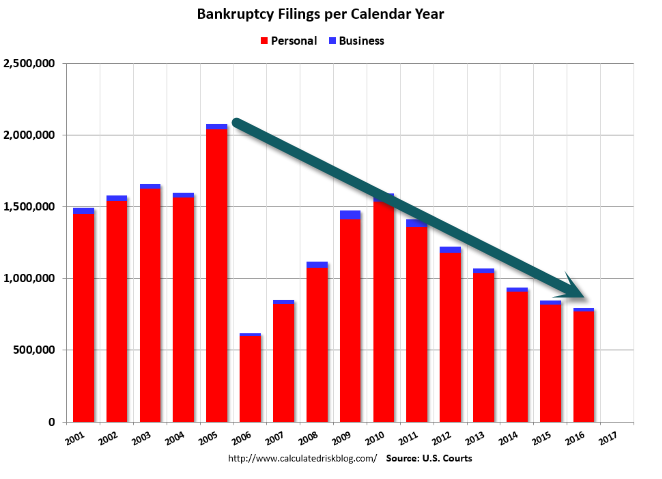 We are ignoring all bubble oracles as they have swept MBA schools with tales of 2008 short-selling glory and have created a thundering herd of financial asset blimp astrologers. One thing does scare me, however. I don’t know anyone who is bullish right now.